It follows by implication that the development of the voiceover profession lies somewhat hushed in the haze of history and is closely linked to the invention of the tools required to make recordings possible. Nevertheless (and for the sake of nerdish dinner conversation), we’d like to quickly highlight some of the milestones we’ve been able to ascertain during the 19th, 20th, and 21st Centuries. In the 1860s, Edouard-Leon Scott de Martinville recorded a phonautograph of a woman singing the folk song Au Clair de la Lune. In 1876, Emile Berliner invented the first ‘microphone’; a device to be used as a telephone voice transmitter. In 1877, Thomas Alva Edison made a recording of the poem Mary Had a Little Lamb on a phonograph, the first device capable of playback. In the 1890s, Henri Lioret released the first talking toy—a doll that had a phonograph mechanism installed in the torso. It could play back up to 35 words. In the 1900s, Reginald Fessenden, a Canadian inventor, was able to establish transatlantic wireless telegraphic communication. He broadcast a live Christmas message that was heard by ships along the northeast coast of the Atlantic. In the 1920s, the Queensboro Corporation of NYC sponsored the first legal radio ads. In 1928, Walt Disney himself voiced Mickey Mouse in Steamboat Willie. In the 1930s, the Screen Actors Guild (SAG) was founded to eliminate the exploitation of actors in Hollywood who were being forced into oppressive multi-year contracts that didn’t include rest periods and, most of the time, dictated both the public and private lives of the performers who signed them. In 1930 Equity, a UK trade union for professional performers was formed by a group of British talents working for the rights of artists across all sectors of the entertainment industry. The idea of the audio book, or talking book, first originated in the United Kingdom in 1934 when the Royal National Institute for the Blind (RNIB), their intention was to provide reading material for blind and partially sighted veterans injured during World War I. In 1937, the American Federation of Television and Radio Artists (AFTRA) was founded to represent a much broader talent base. Also, Mel Blanc, ‘the man of a thousand voices’, began his extraordinary career. In the 1940s, a small group of performers in Canada got together and formed the Radio Artists of Toronto Society (RATS), this was the beginning of what we know now as ACTRA. In 1941 Bulova watches ran the first TV ad. In the 1950s, TV began dominating the media industry, bringing with it a new era of entertainment. Casting directors started becoming a force to be reckoned with. In the 1960s, dialog replacement (dubbing) in TV and films became popular. Don LaFontaine (see the chapter on Success Stories) recorded his first movie trailer voiceover in 1962, soon becoming the voice of the movies. By the end of the decade, agents became third parties who negotiated deals between studios and clients, making the need for such services an imperative for each party. Agents were soon regarded as a necessity, not an option. In 1968 in Japan was developed the first general English text-to-speech system (abbreviated as TTS, is a form of speech synthesis that converts text into spoken voice output). One of the first usages was a portable calculator for the blind. In the 1970s, the rise of mass-market films popularized movie trailer narration, which boosted the voice-acting profession tremendously. The beginning of the modern retail market for audiobooks can be traced to the wide adoption of cassette tapes during the 1970s. In the 1980s, full motion video games started taking hold as a primary source of consumer entertainment. The animations were often voiced by the game’s animators. In 1988, ISDN (Integrated Services Data Network) defined standards for digital relay of voice, video, data and other services over the traditional telephone network. It is still used today, although it’s popularity is waning due to Internet broadband alternatives. In the 1990s, the global computer network known as the Internet took hold, improving global communications. In the 2000s, the rise of online casting platforms revolutionized the traditional agency-based model of sourcing voice talent. 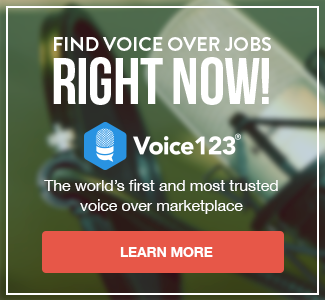 In 2003, Voice123—the first platform of its kind—was founded by husband-and-wife team Alexander Torrenegra and Tania Zapata (see Prologue). In 2011, ACX (Audiobook Creation Exchange) a marketplace to connect and create audiobooks was launched by Audible.